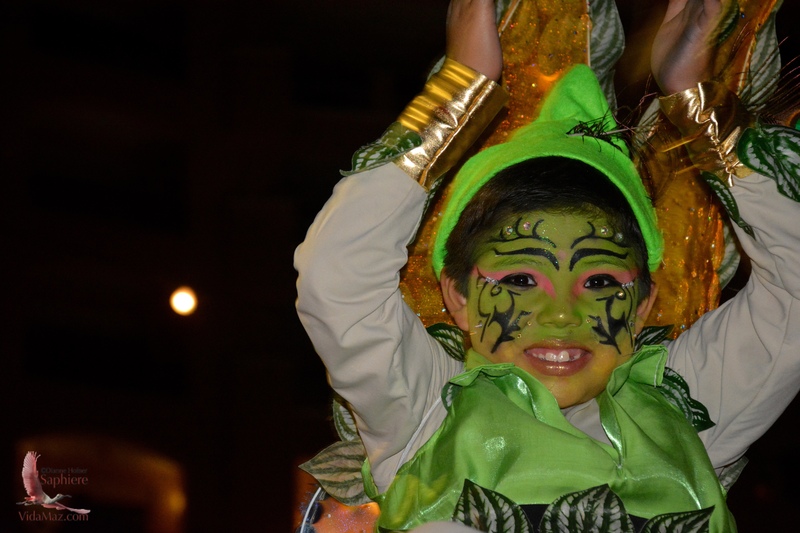 Loads of Pics of Carnavál Parades 2015 | ¡VidaMaz! We absolutely LOVE the Carnavál parades every year. There is nothing better than a bunch of Mazatlecos in good humor, with their dancing shoes on and ready to party! Everyone from toddlers to grandparents get in on the fun. Mazatlán’s first Carnavál was 117 years ago (1898), and 2015’s parades had 31 floats. Dance troupes from studios and schools all over town participate in our parades. I love all the youthful exuberance and excitement as these kids, who’ve rehearsed for months and raised money for costumes, get their big day in the limelight. It is a city tradition, involving at some point in time nearly every family in town, it seems. I enjoy watching them in the parades, and also as they put on their makeup, chat, eat and warm up prior to the parades. I especially love the young couples in love. Here are just a few of my favorite Carnavál faces of 2015’s parades. Click on any photo to see it larger or view a slideshow (highly recommended). The parade on Sunday had 300,000 spectators, not to mention those on Tuesday! 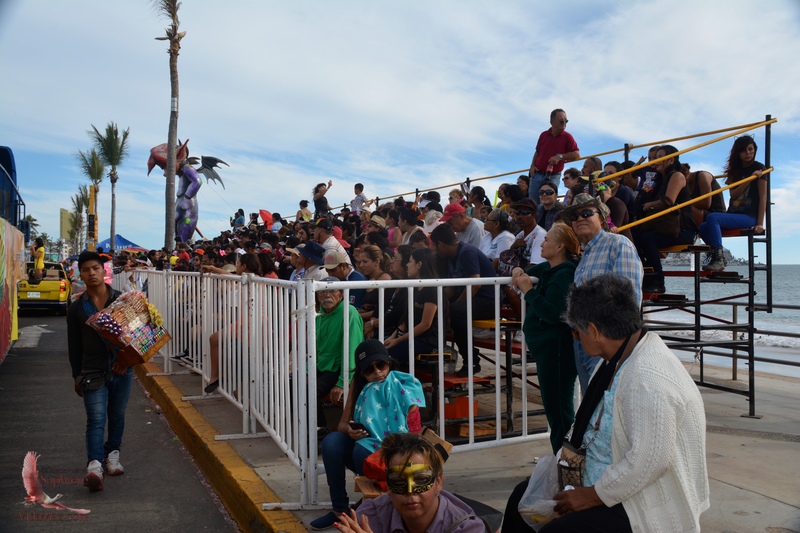 The city supplied free bleachers with 15,000 seats this year, making Carnavál fun accessible to more people. Most of the people in our condo building prefer to watch the parade from the pool deck. From there they can take photos of whole floats, with the bay and the sunset in the background. We prefer our annual street-side party, where we can cheer on the dancers and join with them when they invite us to do so. It’s great fun! Click on any photo to see it larger or view a slideshow. This year the pre-parade came round and we all caught beads, hats, t-shirts and other gadgets. The main parade, however, was well over an hour late. It started fairly on time; we saw the fireworks. But then it stopped. We waited. We drank and danced. We talked with our neighbors and friends. We enjoyed the clowns and vendors passing by, and the families and kids playing in the street. And we wondered what had happened to the parade. It seems a generator failed on one of the floats, and it took quite a while to get it functioning. Also, a huge group of people were blocking the parade route, and the police had to restore order to the scene. Finally, about 8:00 pm, the first parade reached us. The theme this year, “Dreams of Momo,” the god of merriment, was interpreted as one of fantasy and mystery, including a variety of entries such as Ali Baba and the 40 Thieves, dragons, fairies, Indian goddesses, unicorns, a Medusa-like octopus, China, Japan, Egypt, and Native American chieftains. As you know, Maestro Rigo Lewis, who designed our royal floats for over 50 years, passed away last year. This year of course was a transition year. I’m afraid it was a rather disappointing one. The royal floats were not nearly as regal, intricate, realistic or impressive as we have grown used to—no one gasped or said “wow” like they usually do. We have been told by some of the designers that CULTURA was afraid of losing Rigo’s legacy, so they wouldn’t let them create freely, but rather had them attempt to honor his baroque style. On the other hand, we’ve heard and read that CULTURA is eager to forge a more modern, minimalist style of floats. All I can say is, I hope the outcome is better next year. The regular floats were uneven; some were really quite cool, and some looked like they were put together by high schoolers. For the first time ever, some of the commercial pre-parade floats were better than those in the main parade! We saw plain, undecorated iron rods and scaffolding; generators right in the middle of floats, blocking the view of key elements; floats that were very obviously made for third-story rather than street viewing, which ruins the whole tradition in Mazatlán of a street party and caters to the privileged; floats such as that of Momo that were so plain as to be embarrassing; people showing through sheer fabric on the floats when we weren’t supposed to see them; lights that were too direct and overbearing; and floats that had so many elements to them that there was no viewing angle from which you could see the main points clearly. All in all, the floats were not up to the standard that CULTURA has set for us. But, it is a transition year, and we can hope that 2016 will be better than ever. There were quite a few LED floats, which we saw the first time a few years ago in the children’s parade on Monday night. This year, there was no children’s parade, nor were there fireworks on the malecón on Monday night. We really missed this, as did tens of thousands of Mazatlecos and tourists. The Espinoza Paz concert in Olas Altas was great, but not a replacement for a family-friendly, easily accessible and free-of-charge activity like the parade and fireworks. In the end, it was a TERRIFIC couple of parades, with everyone feeling joyful and happy. Beautiful community-building was had by all. Complaining that some of the floats weren’t up to the incredibly high standards set in previous years doesn’t diminish the unbelievable wonder of the event. Thank you, Mazatlán, CULTURA, dancers, and everyone involved! Beautiful photos! If the floats were not as spectacular this year, you surely captured the spirit of those who were in it and attended. Thank you so much … keep sharing! Thank you, Heidi! So glad to hear that! 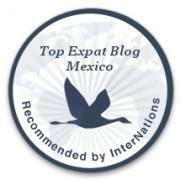 We are so blessed to have such a well-embedded, joy-filled tradition here in Mazatlán!